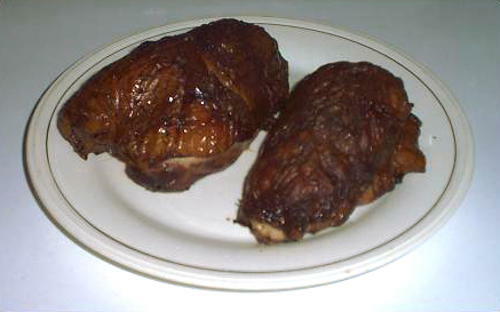 Smoked Pheasant Breasts Are Delicious! This recipe is not for smoked pheasant under glass...it's for pheasant under chicken skin. I use the skins from chicken leg quarters to protect the delicate wild pheasant breasts from the drying effect of the smoker. 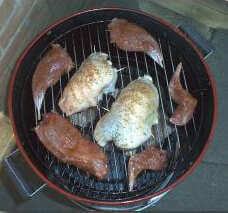 The fatty chicken skin helps the smoking pheasant retain moisture and adds a bit of flavor. Dissolve the salt in the cold water to make the brine. Soak the pheasant in the brine overnight, but no more than eight hours. When the birds are finished brining, rinse them and dry them off with paper towels. Mix up the spices and season the breasts lightly on all surfaces. Wrap the chicken skin over the pheasant so it's covered completely on top. You may have to play with the positioning a little. I use one whole piece and one half piece of the leg quarter skins on each breast. When the skin is in place, secure it with toothpicks. Dust a little more of the spice mix onto the skin. I've used alder and apple for smoke...these will give the pheasant a light smoky flavor. Smoke for two to four hours at 230 degrees Fahrenheit, or until the temperature of the pheasant reaches 165 degrees.